The Australian Alps Walking Track traverses rugged remote alpine country in Victoria, NSW and the ACT. Bushwalkers must always be experienced, self reliant and have good navigational skills. It is important that you plan, prepare and equip yourself well for a walk on the Alps Track. Weather conditions in the mountains are colder, wetter and much less predictable than at lower altitudes. During winter and spring snow can cover long sections of the track. In summer, thunderstorms are common and snow may fall, especially on the higher mountains. You need to be equipped for camping in all conditions and to be familiar with the symptoms and treatment of dangerous cold stress (hypothermia) and heat stress (hyperthermia). We carried a full set of topographic maps and these were essential. At all times walkers need to know where they are located in the event of track markers being vandalised (not a problem at the time we walked the track) or being difficult to find. Ross Walker, December 2000 (After completing the entire walk). Planning for your walk on the Australian Alps Walking Track is a matter of following common sense guidelines. Choose your walk based on the bushwalking skills and knowledge that you and your group have. Keep your party small; four to eight people is ideal. Obtain as much information and advice about the Alps and the section of the Alps Track you intend to walk. Find out about any hazards or risks and how to deal with them. The weather in the Alps can change dramatically at any time of the year. Prepare for the worst conditions and check the latest weather conditions before you depart. Let someone know where you are going. Leave trip details (return date and time, planned route, group member names, and vehicle details) with a responsible person or the police. Don’t forget to check in when you return. Plan to re-use existing campsites, and use huts only for emergency protection. 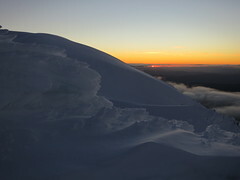 consider joining a bushwalking or mountaineering club to gain more experience if you intend to do a lot of bushwalking. 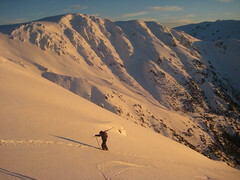 Having the correct equipment is vitally important for overnight or extended trips on the Australian Alps Walking Track. Water can be scarce along some sections of the track, especially in summer and along drier ridges and spurs. Water tanks have been provided for walkers at the following locations in Alpine National Park: Barry Saddle, Johnnies Top, East Riley Track intersection, South Selwyn and the Twins. Firewood supplies are limited especially in the alpine and subalpine areas so only light a fire if absolutely necessary for warmth and cooking. Do not light fires above or near the tree line. If you must have a fire, keep it small and within officially constructed fireplaces provided. No fires including camp stoves may be lit on days of Total Fire Ban. In Namadgi National Park fuel stove only areas are areas close to public roadways, walking tracks, huts, ecologically sensitive sites and the Cotter River Catchment. Fire permits are required for all campfires all year round. are good sites from which to explore sections of the Alps Track. Note: Refer to the Australian Alps Touring Map for more details on these and other camping grounds in the Alps area. The Australian Alps has around two hundred historic huts, some of which are located near the Alps Track. The huts come from every era and some of them date back to the 1860’s. They were built for shelter by graziers, goldminers, foresters, government workers, skiers, and bushwalkers and each hut tells its own story. Huts are for temporary shelter only, not for accommodation as their special values can be destroyed. Never rely on reaching a hut. Plan for every situation, take shelter before you get wet and tired. 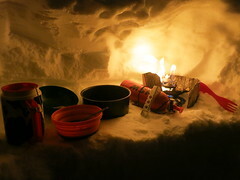 If you need to light a fire in a hut to keep warm, keep fires small and within existing fireplaces. Never leave a fire unattended and ensure it is out before leaving. Use a fuel stove. For cooking and reduce your use of firewood. Some areas are designated fuel stove only. For more information about visiting the huts see the Huts Code. Note: You will need to check if summer accommodation is available in the Alpine Resorts. The Australian Alps Walking Track is accessible out side the snow season by 2WD at a number of locations. The following is a list of the main 2WD access points beginning with Walhalla. Walhalla / Baw Baw National Park at numerous sealed road access points including the Walhalla township, Baw Baw National Park and via several gravel roads in, and just north of this area. 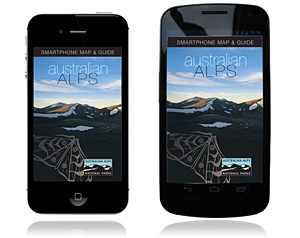 Note: For more details see the Australian Alps Touring Map. Please note that the walkers did attempt to complete some very long days. On longer walks it may be necessary to make food drops. At the resort areas you can most likely leave food somewhere in cardboard boxes. At other locations you will need to pack your food in secure, animal proof containers and hide in the bush so that only you can find them. And remember to collect the containers after the walk. John Chapman’s web site also provides suggested itineraries for walking the entire length of the track, how to prepare for food drops and what permits are required. If you are planning to walk the whole Alps Track or a particular section you will need to consider how you get to your start point and return from your finishing point. If completing the whole track and starting at Walhalla: a train service leaves daily from Melbourne to Moe (closest town with public transport access). Moe is about 50 km to the south of Walhalla and from there you will need to either arrange your own drop off or get a taxi. There is no public transport between Moe and Walhalla. If finishing the walk at the Namadgi Visitor Centre in Tharwa, you will also find that there is no public transport to or from the Visitor Centre. Canberra is approximately 30 km away and can be reached by taxi.